Verizon iPhone Tested Over WiFi in the US? According to Engadget, they received a tip that Flurry Analytics was showing data that could have AT&T devices were being used on Verizon’s data network. The speculation initially was that this device could have been an iPhone being tested at Verizon. This rumor would have confirmed, or at least brought closer, the concept of an iPhone being released at Verizon. a snippet of data allegedly from the recently reliable Flurry Analytics — then at least a handful of non-AT&T phones are currently in play. The numbers show a polling of carriers a particular app is being tested on, and there’s no denying that Verizon is most certainly on that list… albeit in small numbers. Now obviously this is in no way conclusive evidence of anything, and you’ve got to allow for the possibility — however pathetic and slim — that someone is just Photoshopping this little infographic, but if it’s accurate, well… that’s something. Engadget came back and udpated their article with some news back from Flurry who said that the data is actually from Verizon DSL of FiOS subscribers using their iPhone at home over their WiFi connection. 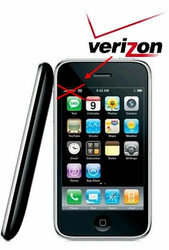 However, there is no disputing the fact that both Apple and Verizon are wanting a Verizon enabled iPhone.